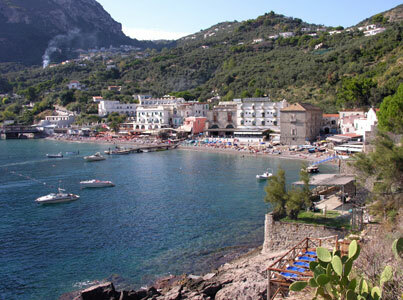 Another very beautiful and original coastal village, Marina del Cantone, is located in the south of the peninsula. The village is located around 15 km from Sorrento and you get there by taking beautiful, small roads through the countryside. The traditional charm of the small village and the rather large beach surrounded by rocky cliffs make this a perfect place for a day at the beach. It is a pebble beach and here you find much space to enjoy the sun. You can also climb over the rocks at both ends of the bay,to reach other small coves, and when you are lucky you will be all to yourself to enjoy the clean and clear water and the sun. In Marina del Cantone you can find everything you desire: small free and lonely beaches, lidoes with good services, restaurants and also a great diving area. View at google maps "Several, beautiful bays on the southern side of the Sorrento Peninsula"